I've been doing SQL optimisation for some of the services at work recently and saw that we've been using EXTRACTVALUE in a number of places. This is not bad in itself, however the Oracle 12c documentation states that EXTRACTVALUE is deprecated and should be replaced with XMLTABLE. The EXTRACTVALUE function is deprecated. It is still supported for backward compatibility. However, Oracle recommends that you use the XMLTABLE function, or the XMLCAST and XMLQUERY functions instead. See XMLTABLE, XMLCAST, and XMLQUERY for more information. Now I knew that the particular query I was looking at wasn't performing terribly great so I decided to try out XMLTABLE in it and got some amazing results. In my case the SQL execution time was 4.5 times faster when I switched to XMLTABLE! The XMLTABLE approach always had constant performance, no matter whether it was extracting 1 or 5 XPATHs. 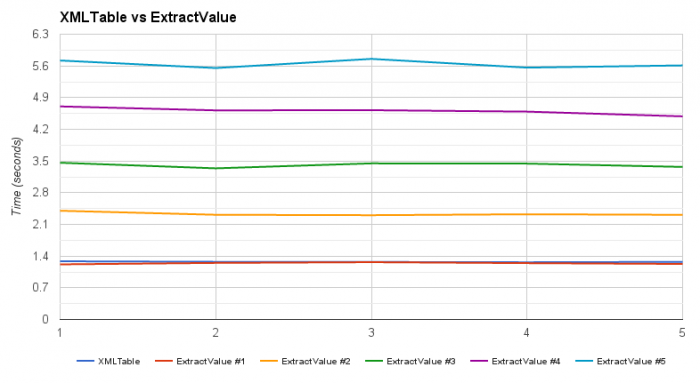 With EXTRACTVALUE the performance varied as described earlier - the more XPATHs the slower it was. Both of the SQLs return the same results, however the XMLTABLE based query runs significantly faster. The tests were done when selecting a 1000 XML document result set from the database. The ORDER BY clause is present to force the whole result set to be processed to give accurate timing information. 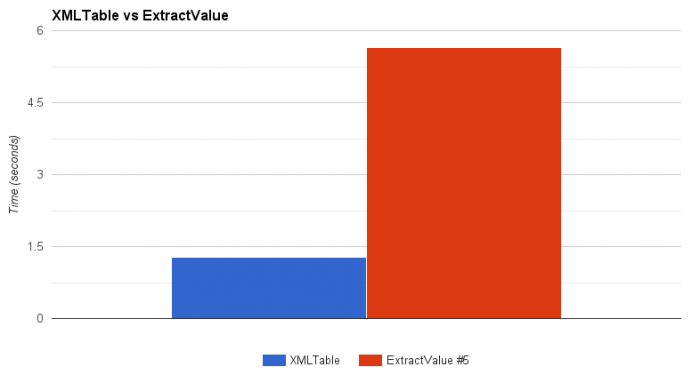 So there you go, if you are still using EXTRACTVALUE and are pulling out more than 1 XPATH from your XML then it is worth switching to the new XMLTABLE approach!